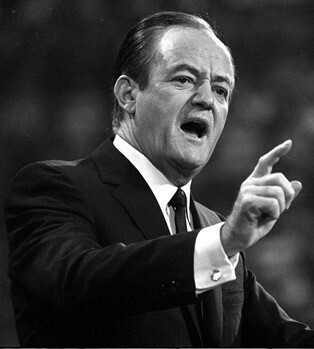 It was fifty years ago today- August 28, 1968- at the Democratic Party National Convention in Chicago- Hubert Humphrey was selected by the delegates to be the Democratic nominee for President of the United States. The final ballot showed Humphrey with 1759 1/4th votes, Senator Eugene McCarthy 601, Senator George McGovern 146.5, Rev. Channing Phillips 67.5, Daniel Moore the Governor of North Carolina, Senator Ted Kennedy, Alabama football coach Paul “Bear” Bryant, James H. Gray and George Wallace received token support. Vice President Humphrey who had been lusting for the nomination and the presidency all his life- was now the Democratic nominee and due to the events that took place at and around the convention and his sticking to President Johnson’s Vietnam policies he would start way behind in the polls behind the Republican nominee Richard Milhous Nixon. Humphrey would change his policies during the campaign on Vietnam but would still come up short in November.